Distinctive sounds and great music do not always go together. But the Sautex label has a nose for finding acts combining both, whether on the stage or in the recording studio. They do not disappoint with one of their newest finds, San Antonio roots rockers, The Hares. Their debut album, Smoking in Bed, offers twelve tracks of broadly-influenced roots rock that feel, at once, authentic and fresh. Hailing from San Antonio’s musically vibrant Southside, The Hares coalesced around the songwriting and vocal team of Buddy Parland and Harvey McLaughlin, both veterans of a number of other Alamo City roots rock projects. In this age of trios and quartets, the seven-piece Hares make a bold statement about what a real roots band looks like. Currently, the band’s line-up includes Parland, guitar/vocals; McLaughlin, piano/vocals; Richie Brown, standing bass; Richard Rodriguez, cocktail drums; Wally Sandoval, trumpet; Manny Sauceda, tenor sax and Mike Chia, slide trombone. 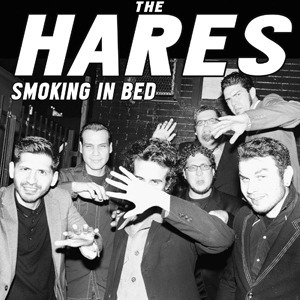 At first listen, The Hares might actually seem to be three bands. The vocals are often those of a hard-bitten (and hard-biting) East Coast punk outfit. The strings walk the line between rockabilly and surf. The horn section appears to desperately wish it was still the 1950s. But cognitive dissonance does not equal musical discordance. Out of a situation where it seems like no one is getting what they want, magic happens. The ferocious vocals energize the rest of the band. The strings lend The Hares a sterling roots rock credibility. The horn section becomes whatever the band needs them to be at any given moment, equal parts Marty Robbins, Misfits and Ventures. Unsurprisingly, given their San Antonio origin, the band makes frequent use of southwestern and Texan themes, on display in songs such as “Mexican Jail,” “Vulture Stew,” and “Alvarado Sun.” Paranormal and occult themes are also common in The Hares’ music, such as “Talking to a Ghost,” themes both McLaughlin and Harvey have explored since earlier projects. A few titles on Smoking in Bed, notably “Chupacabra” and “Ghoul Goes West” tie together both the southwestern and supernatural. Music journalists both love and hate bands such as The Hares that defy a tidy genre label. The ubiquitous “psychobilly” doesn’t do justice to the full range of their sound and influences. One might be tempted to call them “surfabilly,” if they lived within 100 miles of a coast. Given the dark, and sometimes explicitly supernatural, themes permeating their music, “gothabilly” also seems like a promising tag, but the music doesn’t quite support it. The band itself offers descriptors such as “Voodoobilly” and “Satanic Spaghetti Western.” So, instead, I will simply have to tell you that The Hares play blistering rock n’ roll, served up with a constantly shifting cocktail of roots influences. The opening track, “Song about a Girl,” brings sounds of both punk and rockabilly without quite qualifying as psychobilly. The vocals and the overall feeling of the piece are evocative of The Sweet, especially their best known work, “Ballroom Blitz.” Fans of furious string work will be very pleased with this song. Also look for a piano solo that would give Jerry Lee Lewis pause for thought. Recently, I was lamenting that no one makes good use of horns anymore. The Hares give me hope. The horn section is an integral part of their sound and nowhere on Smoking in Bed is that more gloriously displayed than “Wreck Dat Party Dress,” an enchanting number that could best be called cabaret-punk. While guitar, bass and percussion are not to be missed, it’s the horns that carry the lead-lines throughout the piece, especially Sauceda’s frenetic tenor sax. “Vulture Stew” leans more on pure punk that the rest of the album, a perfect vehicle for the band’s vocals, which mostly eschew traditional melody in favor of cadence, inflection and, this cannot be emphasized enough, volume. But, even here, horn flourishes and more intricate lines on guitar and bass prevent “Vulture Stew” from being a simple punk-by-numbers piece. Whether a conscious effort by The Hares or not, “Mexican jail,” is evocative of influences as diverse as Elvis’s “Jailhouse Rock,” The Vapor’s “Turning Japanese” and Lou Reed’s “Take a Walk on the Wild Side.” Twisting a classic story song in strange directions, “Mexican Jail” detail’s the singer’s adventures and misadventures in the titular location, dealing with wise drag queens, melancholy killers and other characters (“Roll call reads like casting from some half-forgotten fever dream”). In addition to engrossing lyrics, it’s a strong instrumental number—with a sax solo reminiscent of King Curtis, good trumpet marking the instrumental bridges and some great fuzzy distortion on the guitar. While the idea of a “signature sound” seems anathema to what The Hares are about, “Mexican Jail” is as representative of what they do as any track on the album. An instrumental number, “Ghoul Goes West” provides an opportunity to examine the diversity of influences and impressive talent going into The Hares’ instrumentation. Drummer Rodriguez really shines with his energetic percussion. The string work does a great job of channeling the best of both rockabilly and surf while the horn section sounds like Marty Robbins gone Goth. Later in the number, also look for some beautiful ivory-tickling by McLaughlin. A ballad of dysfunctional romance, “Too Late To Save Your Skin” kicks off like a high-volume Golden Age rock and roll number. Vocals follow in kind. Even at their most rambunctious, they are more melodic the band’s typical roar. At moments, they could even be described as a smooth croon and feature nice duets between Parland and McLaughlin. A little slower than most of their numbers (itself indicative, the tempo of “Too Late To Save Your Skin” is moderate-to-fast). The more relaxed tempo also highlights McLaughlin’s guitar skills to good effect. Unfolding with a rhythm that can best be described as cracked-out honkytonk, “Chupacabra” details an encounter with the eponymous goat-sucking cryptid—and then takes an unexpected left turn as it evolves into buddy song, with the singer and the Chupacabra taking a road trip to New Orleans. In addition to the song’s truly bizarre lyrics, look for great psychobilly percussion and guitar work with some glorious accents from the horn section, especially Chia’s trombone. I have been delighted to see so many young bands taking up the roots rock mantle over the past decade. The fly in the ointment is that many of these combos approach their vocation with a somber seriousness, even a reverence, which misses the point. Roots rock was always about the fun—something, unlike many of their peers, The Hares seem to intuitively understand. This, combined with their mastery of a colorful pallet of roots styles, sets them apart from legions of young, would-be roots rockers. Smoking in Bed is a worthy addition to the collection of fans of roots rock, psychobilly and related genres. That this is The Hares’ freshman album makes it all the more remarkable. You can check out The Hares’ page on the Sautex website for more information on the band, to order Smoking in Bed and to read an interview with Parland and McLaughlin. You can also visit The Hares’ FaceBook page.